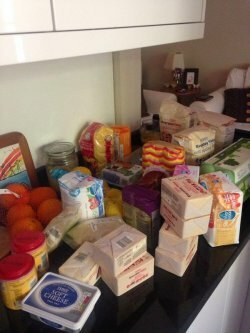 Click on a title (or just a year) to be taken to the photos you want to look at. Note that the target you click on will in most cases be at the very top of the resulting page so you may need to scroll down a little bit to bring the photos into view. 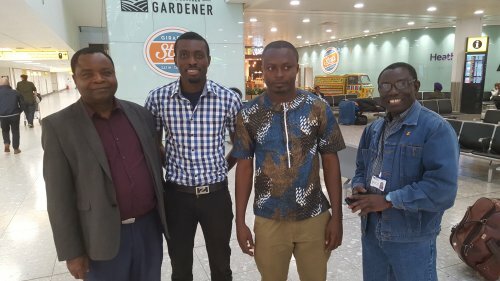 Tamale Doctors for training in London re-union at Heathrow. Joined by Mr Caesar Mensah and Mr Ofori-Atta. Doctor from Motec collaboration with Ghana arrives in London for his two year training. 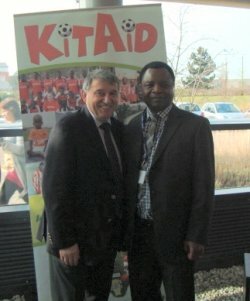 Welcoming Dr. Adamu are two Motec Trustees and a representative of the UK hospital. 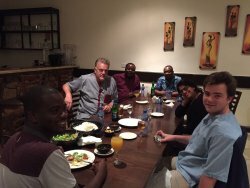 Ghanaian community renew friendships at Dragon Gardens Restaurants in Hemel Hempstead. 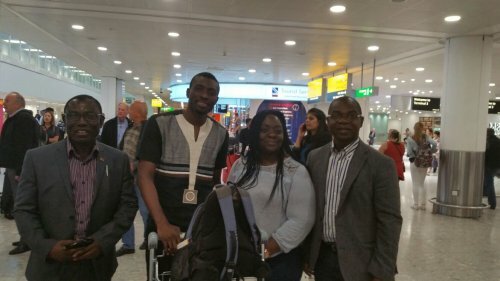 Two nurses from Ghana were in UK for orthopaedic trauma equipment handling course for one week. The nurses received lectures and training on equipment handling in joint arthroplasty and long bone fracture fixation. The nurses have since left UK and arrived safely back. 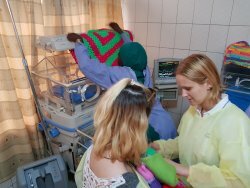 It expected of the Nurses to train local theatre staff in their various places of work. The training programme covered hip, total knee, total hip ad mini-hip replacements and long bone intramedullary nailing. We are grateful to all the UK orthopaedic manufacturing companies for their import. including De-Soutter Medical and Smith and Nephew. Our sincere gratitude to sponsors and the nurses. 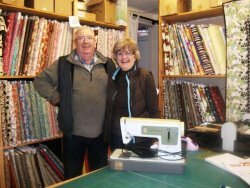 Last but not the least, also our thanks to Motec Secretary Mrs Kay Bowers who looked after the welfare issues of the nurse. The class of 1983 of the University of Ghana Medical School Korle Bu in line with Motec Project 9 - ‘Diaspora's contribution to medical education through investment in human resources, provision of educational material and development of infrastructure’ - raised funds from members resident in UK in support of education. 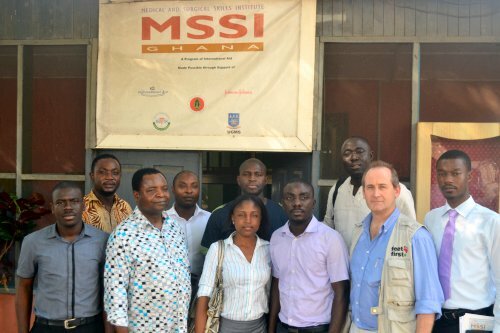 The doctors guided by senior members of Motec raised a substantial amount of funds to purchase computers for schools in the suburbs of Accra. 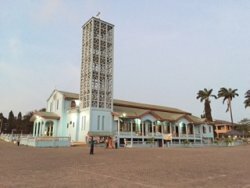 The institutions included St Mary’s Catholic Girls Basic School at Korle Gonno, James Town Methodist Basic School, Korle Gonno Roman Catholic Boys School and Korle Gonno Methodist ‘A’ Basic School. 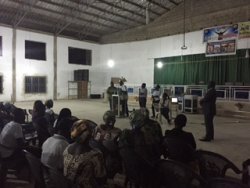 Pictures show the presentation of the computers to the Schools in Accra by representatives of the group. 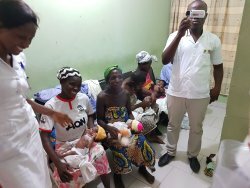 Sincere gratitude to the group especially the Motec members in helping support of schools around the teaching hospital in Accra. Bravo Christine and Sarah, executives of UGMS 83 and the class of 1983. 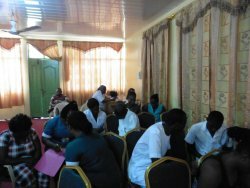 Motec may approach the group to support the construction of a safe infrastructure for Abisim Nankese in the Eastern Region which is currently led by School and Health Foundation of Ireland. An amount of £310 has been donated by the Stockwood Park Academy Luton to Motec. thatch structure the children are currently using. Gratitude to the school children and the authorities. Pictures above show the main link teacher Alyson and other pupils/students of the academy. Motec Welfare Officer Mrs Linda Bigham represented Motec. The school breaks for the summer today and it hoped that when it reopens in September Motec can formallymake a formal representation to express our profound gratitude and show the school what the money has been used for. Motec is currently looking for a school(s) in UK to assist in fund raising to build Nankese Abisim L A Primary and Kindergarten School. 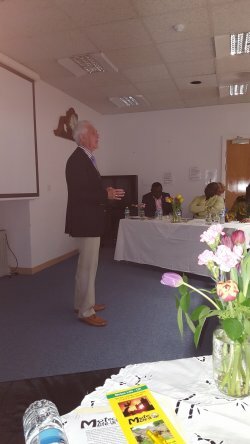 The project is part of the School and Health Foundation of Ireland's collaborative efforts for Ghana. 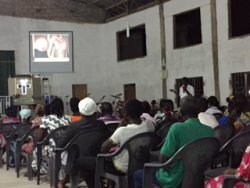 Breast clinic at Akosombo and Accra; Breast awareness sessions at Yilo Krobo High School ( over 1,500 attendance; Public awareness lecture at Akosombo Apostolic Church; and Surgical work at Akosombo VRA Hospital. 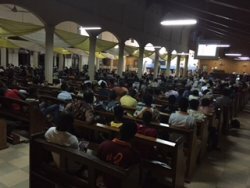 Pictures show some of the activities by the team in Ghana. Bravo Charles, Sanjay, Akosombo and all the institutions involved. Next trip will be October. 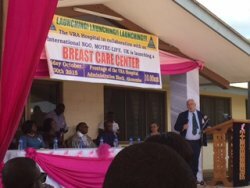 Dr Charles Arhinful of Akosombo in running breast awareness programmes, breast screening and operating during the visit. Mr Ofori-Atta was joined by residents from Korle Bu in surgeries at Koforidua. 20th June was his busiest day. In furtherance of the aims of Motec - School and Health Foundation (SHF) Mr Ofori-Atta held planned meetings in Ghana. 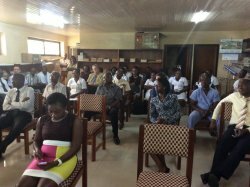 He travelled from Accra to meet the Regional Directors of Health and Education at Koforidua, District Directors at the Municipal Assembly at Suhum and a considerable time at Nankese Abisim, a village about 18km North West of Koforidua, the Eastern Region capital. 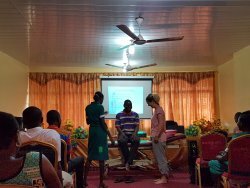 The final meeting took place at Nsawam at the Orthopaedic training centre where children and adults with disabilities are supported by the centre. The Motec - Schools and Health Foundation of Dublin aims at constructing a primary school at Nankese Abisim for the village which provides basic education for about six villages. The other is the construction of a special needs centre for children at Nsawam utilising and expanding the existing services there. Notably the Government of Ghana will play an active part in these facilities in order to sustain the projects such as provision of teachers at both facilities. The local community at Abisim will provide free support such as sand and manual labour for the construction of the school. Motec has also been offered the opportunity by the Regional Director of Education to use a centre in the capital to run workshops to train teachers to identify children with special needs and to learn how they help to these children. It is a welcome move as Ghana has no training centres for teachers to look after children with special needs. A Motec team for children with special needs has been formed to support both projects and it will be led by Elaine. It is expected of the new team to link up schools in England and Ireland with the two centres. 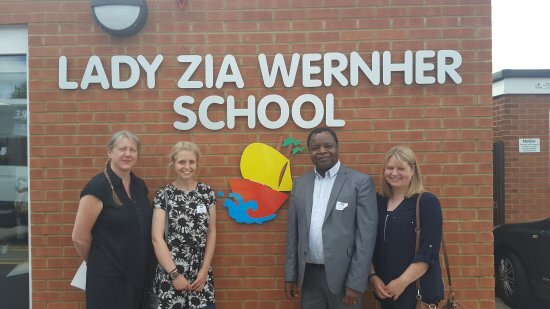 A fact finding and teaching visit to Ghana has been planned by the team has been planned for the latter part of the year. 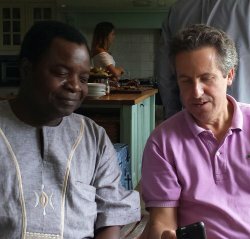 We are grateful to the Ghana College and Prof Standfield for making it possible for the doctors in Ghana to benefit from UK training. 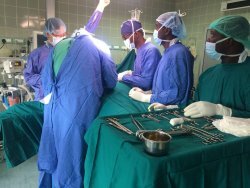 Both parties are keen to ensure that the surgeons return to Ghana. So far, it is reassuring that all doctors and nurses in Motec training programme for the past 7 years have all returned to provide clinical services and some tuition in Ghana. 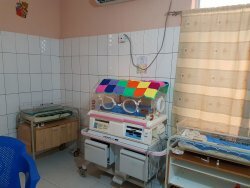 Other projects that Motec held meetings with authorities in Ghana included a School and Health Foundation led projects on a special needs centre for children and a primary school which were both welcomed by the Ghana Health and Ghana Education Services. Nsawam and a village in the Eastern region. Have been put forward by the Regional Director of Health of Eastern Region and members of the public. Stockwood Park Academy is a Mixed secondary school and sixth form located in Rotheram Avenue in Luton, Bedfordshire, England. Sincere gratitude to these young students for their donation and also for placing Motec deep in their hearts. 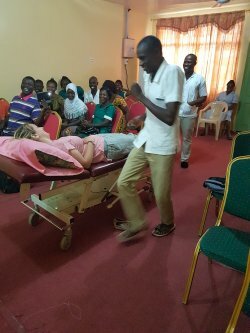 Four Motec volunteers have been involved in delivering a symposium on Breast Cancer and ankle and foot trauma at the West African College of Surgeons Scientific meeting at Ougadougou, Burkina Faso. The Motec team in the capital of Burkina from 27th February to 1st March, 2017. The team flew into Accra the weekend before flying into Ougadougou. Mr Ofori-Atta linked Motec with the World Orthopaedic Concern-UK (WOC) and The British Association of Ankle and Foot Surgeons (BOFAS) for the symposium on foot injuries. Three presenters run the foot programme. 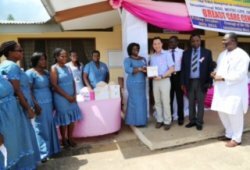 The breast care seminar was run by Motec led by Mr Steven Goh and joined by Miss Natasha Jiwa from UK and Dr Charles Arhinful from VRA hospital, Akosombo. The presentations were well received. Next year's programme is expected to be in the Gambia in 2018 and Motec is expected to run similar programmes. 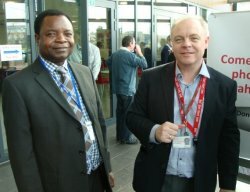 Doctor from Motec collaboration with Ghana arrives in London for his two year training. 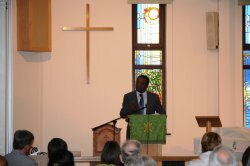 Welcoming Dr. Adamu are two Motec Trustees and a representative of the UK hospital. 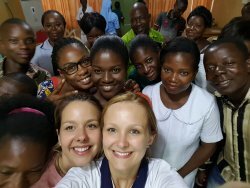 The breast team were at Akosombo, Tamale and Korle Bu teaching Hospital. 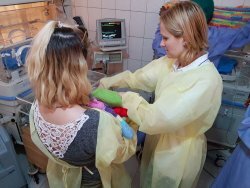 Lectures, breast screening and surgeries carried out during April working visit. Motec orthopaedic spinal team as external eaminers at the West African Fellowship Examinations at Korle-Bu. 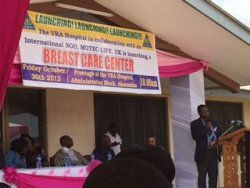 Motec breast care education in Western region is gaining momentum. The magnificent Star Of The Sea cathedral in Aboadze. At least 500 in attendance! 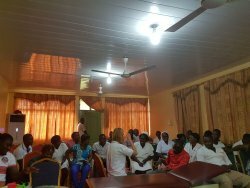 Training of hospital staff on safe casting and rehabilitation post injuries featured prominently in the April working visit casting to Ghana. Two district type hospitals were involved in the workshop which was also attended by nearby hospitals an a few from over hundred mile distance. No casting of any doubt about the commitment of the faculty and the interest shown by the participants in the four day. 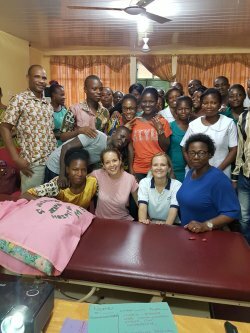 Team consisted of two plaster cast instructors (Mrs Sue Osborn, Miss Amy Beth Tite) 1 musculo-skeletal physiotherapist- Miss Amy Washbrook and 1 trauma surgeon (Mr Akin George- WOC-UK) .The training programme included a mix of lectures, audio-visuals and hands on sessions. Over 100 participants attended the four day training. Benecare Medical of Manchester donated the training material. 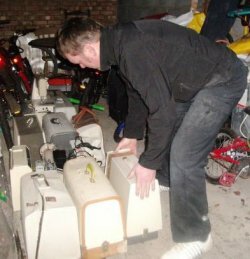 Other British Companies including DeSoutter Medical (donated plaster saw) while other sponsored one member of the team. Beth Tite and her friends also raised lots of money in support of the training project. As a result of the popularity, Motec will be enjoying the magnanimity of Benecare Medical Services who have donated a container load of casting material to Ghana meant for our target hospitals. Casting team- BRAVO! Thank you Benecare, Desoutter Medical and all others! Target hospitals- well done for the care! Teaching will be repeated next year. 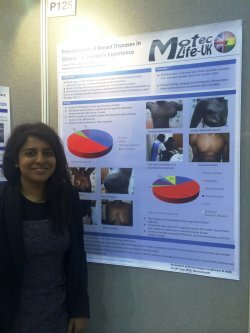 Motec has been made proud by two eminent volunteers who represented our charity at the Global Surgical Conference at the Royal Society of Medicine in London on Tuesday 28th April 2015. 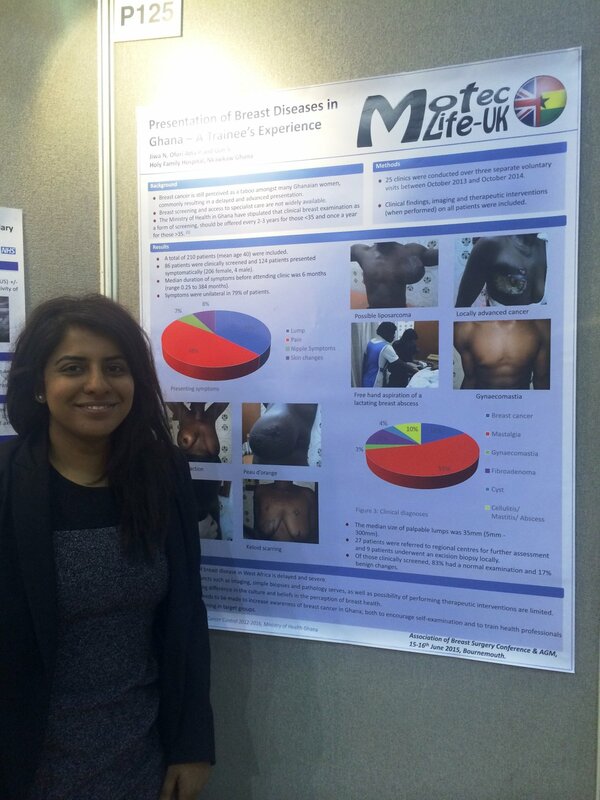 Dr Natasha Jiwa is seen in the pictures presenting Motec projects to the audience in London. 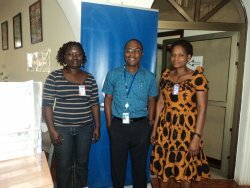 Preparations for the conference was supported by Motec Vice President, Dr Louisa Draper. 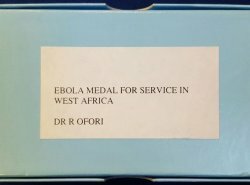 Professor Chris Lavy, convener of the conference lauds Motec in a statement of appreciation in a mail sent to two volunteers. 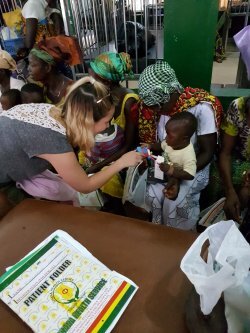 Global Frontiers indeed with Motec volunteers working same week in Nigeria and Ghana. 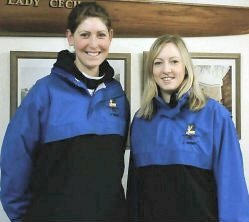 Well done to Louisa and Natasha and all behind the scenes! Congress participants including UK representation. 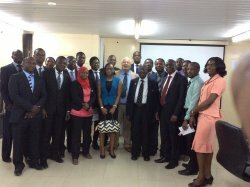 Prof Bo Povlsen and Mr Ofori-Atta (UK) supported the College's educational drive by delivering a symposium on hand injuries. 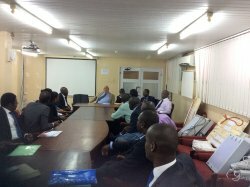 Talks on training programme for West African College junior doctors in UK was discussed. 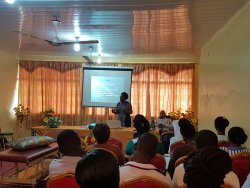 Highlights - Planning of conservative management of fractures workshop and delivering lectures at Koforidua and Akosombo plus talks with target hospitals including Nkawkaw on 'breast care' with links to Korle Bu and pathology services with Newcastle. Gratitude to target hospitals and hard working volunteers. Major visit in April ready to roll! 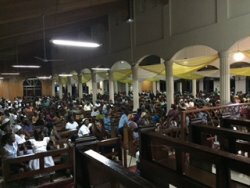 Motec-Life led a 3 man UK team to support the examination faculties of the West African College of Surgeons’ final fellowship examinations in Accra Ghana. 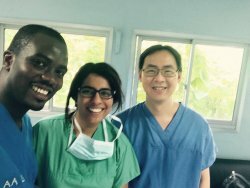 The team was involved in the orthopaedic and cardiothoracic primary and final fellowship examinations in Accra. 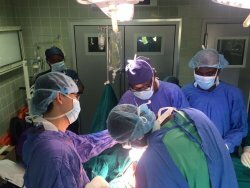 Prof Nigel Standfield, Mr Peter Dyson and Mr Paul Ofori-Atta were in Accra for five days for the exercise which further strengthened the collaboration between UK (Motec, London School of Postgraduate Surgery, World Orthopaedic Concern UK) and the West African College of Surgeons. The working visit has been one of the best since the establishment of the links 2 years ago. 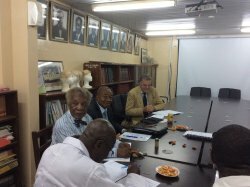 Picture above shows Mr Ofori-Atta (seated centre of picture) and Mr Dyson on his left. Motec expresses appreciation of the work of the volunteers and the WACS executives. 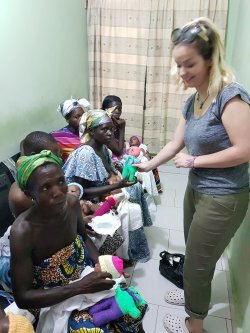 In preparation for Motec’s freight to target hospitals in Ghana and in support of the income generating project for families with malnourished children at Jirapa district (NUWLIFE), Volunteers have been working hard to package sewing machines and equipments at Hemel Hempstead. 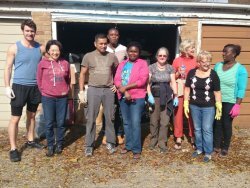 Nine volunteers from Hertfordshire and Southend happily worked together for about 4 hours to pack the first 60 sewing machines and about 50 boxes for Ghana. In the end, the tired volunteers chilled out the Taiwanese way in Hemel Hempstead town centre. 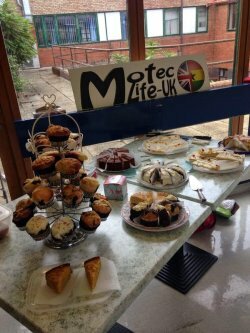 Motec Trio popularly called 'the E.L.K.- defender of the defenceless' organised a 'cake snack' at the Hemel Hempstead Hospital on Thursday 14th August to raise awareness about our charity Motec and to raise funds towards Motec's training and NUWLIFE projects. An amount of £131.00 was raised. Gratitude to all who patronised the event. Congratulations also to 'ELK'. The hospital appeared transformed to a new era of 'purpose and hope'. Meeting at Jirapa by Motec President on Good Friday, after the stations of the cross was attended by the entire hospital management, the District Director of Health, the District Chief Executive, a High Court Judge and a former Jirapa MP. Completed Mothers hostel sponsored by Motec looks elegant. Beds needed to complete the project. Our consortium of Patronsand the British Public have been at the centre of Motec's support for Jirapa. Entertainment galore - variety, good food, excellent venue. Featuring K'z Bollywood entertainment group from London, Draper blues from Cambridgeshire and many others. June 14th is special. 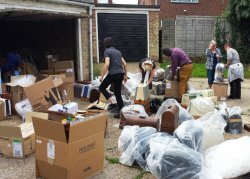 Funds raised will be used to support training programmes by Motec volunteers in Ghana. 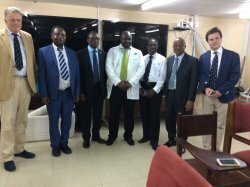 with the West African College of Surgeons.in Kumasi, Ghana in February 2014. Gratitude to all especially the Irwin family, the cooks and guests. please may we ask you to Gift Aid your donation. 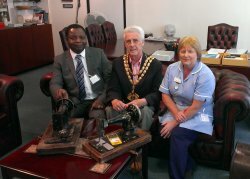 to Motec's NUWLIFE project at the Mayor's parlor in Hemel Hempstead. with Councillor Chapman at the presentation ceremony. to deliberate on projects including links with West Africa. 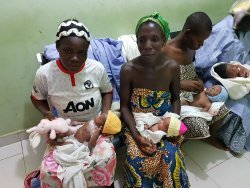 Motec consolidates support for malnourished in Jirapa District through a pro-active programme of farming and feeding with mothers of malnourished children with the support of dietician and local agricultural officers. Nurses from Ghana enjoy a study day at The Corinium Centre, Cirencester including a tour of the Corin factory. 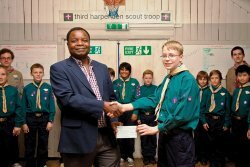 The Harpenden scouts led by their leadership hosted Motec at their anniversary celebration in Harpenden on 30th April 2012. 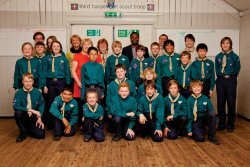 The function was attended by the scouts commissioner and honorary queen mother of Hohoe Mrs Jo Busby. 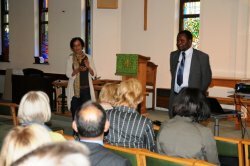 Motec was represented by Mrs Kay Bowers- a personal secretary of Motec’s President, Mrs Linda Bigham- Trustee Executive and Mr Ofori-Atta, President of the organisation. Motec members and friends led by Linda, Kay, Liz walk the walk and talk the talk and raise about £230 for Motec's educational funds. 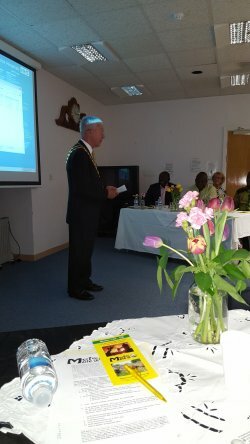 Oti Boateng, Omanhene of New Juaben, President Of Eastern Regional House of Chiefs and Patron of MotecLife-UK at a Dinner Organised in Daasebre’s Honour in St Albans City on 29th January 2012. 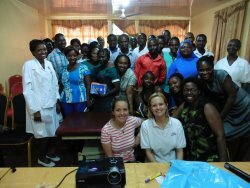 Teams were involved in meetings, clinical work and workshops across Ghana. 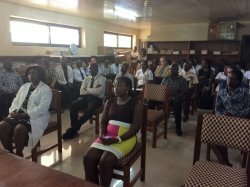 Volunteers were also involved in assessing the possibilities of setting up specialised surgical training schemes between London and Accra. All volunteers have arrived back in UK safely.